What is this plant that spontaneously sprouted in my balcony? I have a big pot on my balcony that has inhabited many kinds of plants over the years. One spring I got to unexpected sprouts from seeds the size of an apple or orange seed. One survived and grew to what is depicted in the pictures here, but then unfortunately I got an infestation of spider mites that killed it. I had previously rented out the apartment, and I suspect that this is the result of a couple of seeds that they intentionally or unintentionally put here. My best guess is that this is some kind of berry or something else edible that you buy in a grocery store. You can also see some sun damage on some of the leaves in the picture. The plant in question is the most visible in the pictures, the others in the packground are passion fruit. There were no thorns, and the leaves felt a little bit hairy, kind of like a common nettle but shorter and a fussier feeling. The height in the pictures is about 30-40 cm and it was growing fast until the spider mite attack. 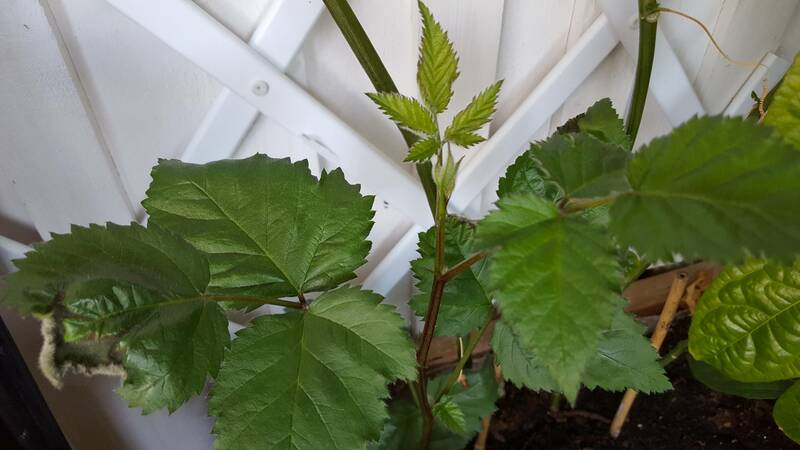 It looks like a raspberry, or some other kind of similar berry plant (blackberry etc.). The triple leaves and the habit of the plant are characteristic. Birds will often eat them and "deposit" the seeds randomly around the Earth. Berry plants usually have thorns or develop them as they grow. If no thorns are present, then perhaps it is another type of interloping plant. Other plants do look similar. In which case, your photos are insufficient for more further identification. Not the answer you're looking for? Browse other questions tagged species-identification botany or ask your own question. 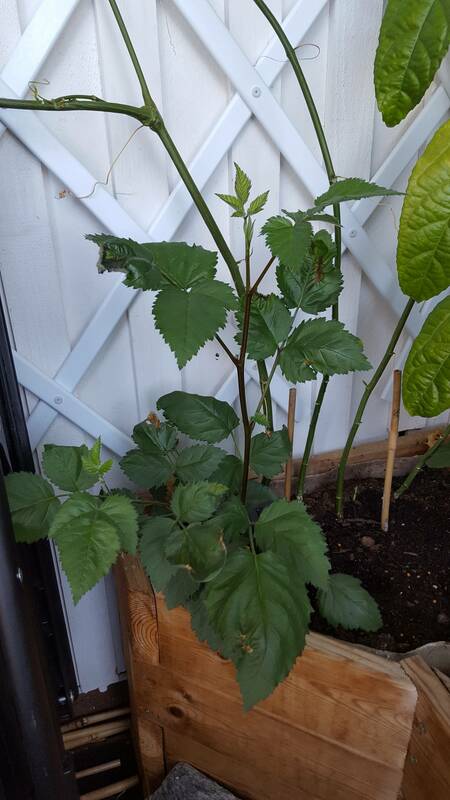 What is this plant …? What flowering green plant is this? What is this anise smelling plant? What is this plant from Morocco? What exactly is this plant resembling Conyza? What is this plant with distinctive leaves? Can you name this plant that likes shade on Asturias?